This year is the 150th Birthday of Charles Rennie Mackintosh. Glasgow should be celebrating – we were celebrating. There is a wonderful exhibition at Kelvingrove which I’ve seen and enjoyed (and intend to go back to) and just yesterday a new mural was unveiled which I’m hoping to see in person soon. But today I woke up to the news that Mackintosh’s iconic Glasgow School of Art has been hit by fire for the second time in four years. It’s devastating – restoration was going well and the building was due to reopen next year. There are no reports of casualties – thank goodness – but Glasgow mourns all the same. The picture at the top of the post was taken the day before the first fire – I was one of the last people to visit the Mackintosh Library. I wrote about that experience at the time and was proud to be contacted by the restoration architects because “You have posted a beautiful photograph of the Library Windsor Chair that is really useful as it’s showing the reinforcements done to the original design.” My picture was to be part of their documentation! The account of my Mackintosh visit is on my long defunct blog Adventures of a Retired Librarian where there are more pictures of what was lost. Last time, a restoration fund was quickly opened up. Today is too early for that, but I’ll keep you posted. Glasgow’s Lighthouse is a Charles Rennie Mackintosh building that used to be part of the Glasgow Herald‘s printing offices until they moved out in the mid-80s. The Lighthouse re-opened in 1999 as Scotland’s Centre for Architecture, Design and the City. 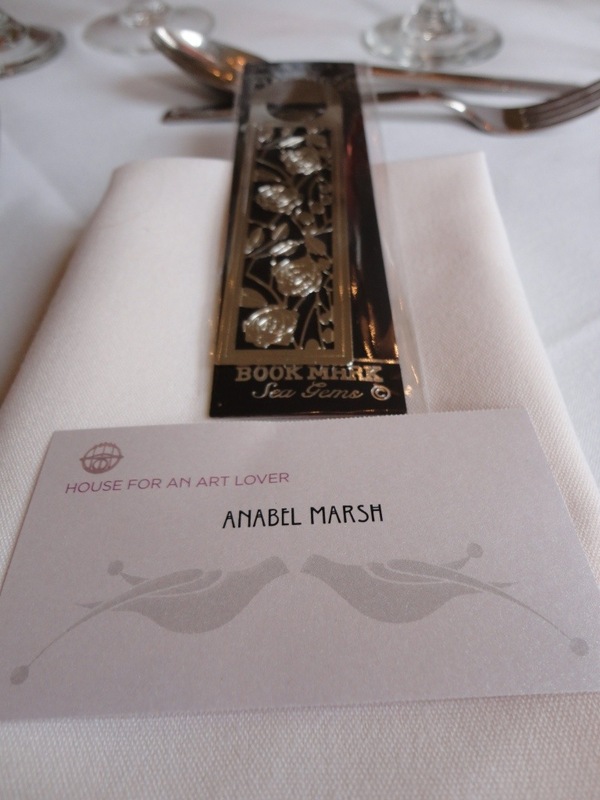 We visited recently for an excellent exhibition on Art Nouveau (phone photos). If you’re in the area and fancy it, it’s only on till tomorrow, so be quick! We also climbed the distinctive tower, which originally contained an 8000-gallon water tank, for great views over the city’s roofscape (John’s photos). Finally, some more shots of the interior. A lovely escape from a wet afternoon! Tom na h’Airidh is a small (354m) hill behind Helensburgh on the Firth of Clyde. (The name is Gaelic for “Knoll of the Shieling”, a shieling being a summer residence for cattle and goats.) We recently climbed to the top following the route on the excellent walkhighlands site – but we’d already made a couple of stops before we got started. ….and behind the house, a beautiful Walled Garden dominated by a 100-ft Wellingtonia tree (Sequoiadendron giganteum) in the centre of the lawn (and plenty of benches to admire it from). Well, if you’ve read any of my other walks you will know the importance of lunch so after the exertions (?) of our morning stroll we headed down into Helensburgh to sample the tapas at La Barca (not bad at all). I like to think our climb burned the calories off, but I fear not. The first part of the walk up Tom na h’Airidh is through oak woodland and forestry plantation – not particularly photogenic and extremely wet underfoot, so there was a fair amount of cursing going on. Once out of the trees, the open moorland was a bit drier (but not entirely so). My two objections to Scottish hillwalking are bogs and tussocks and this walk had both in abundance. Here we are at the top, with the cairn to prove it – I look very pleased with myself! 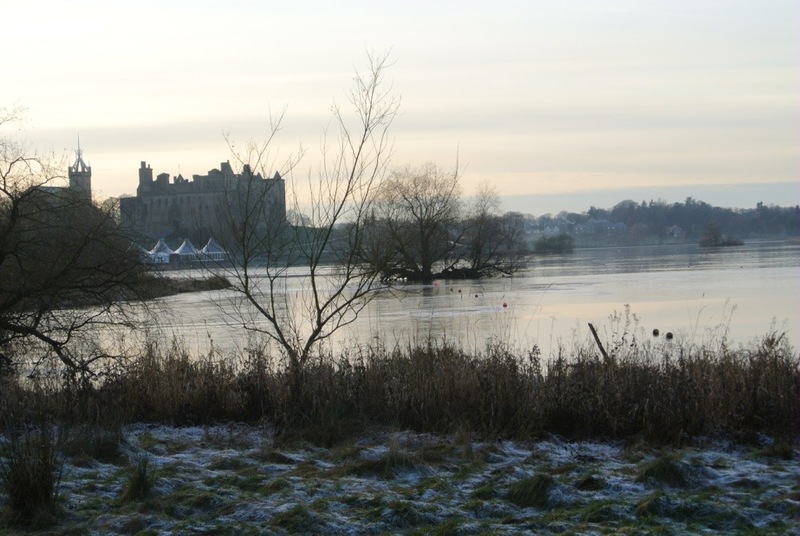 Time to enjoy more views as we retraced our steps back to the car…. ….which was parked outside Hill House, masterpiece of Charles Rennie Mackintosh. The house (also NTS) was closed by then – I’ve been inside many times but never blogged about it. Another time! 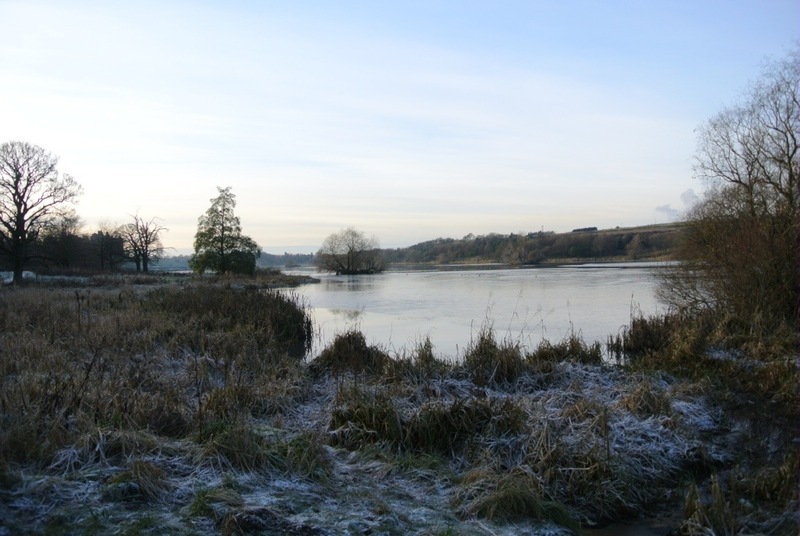 Linked to Jo’s Monday Walks – visit her site for more cyber-walking. Queen’s Cross Church is the only one ever completed to a design by Charles Rennie Mackintosh (he entered the competition for Liverpool’s Anglican Cathedral but his design was not selected). 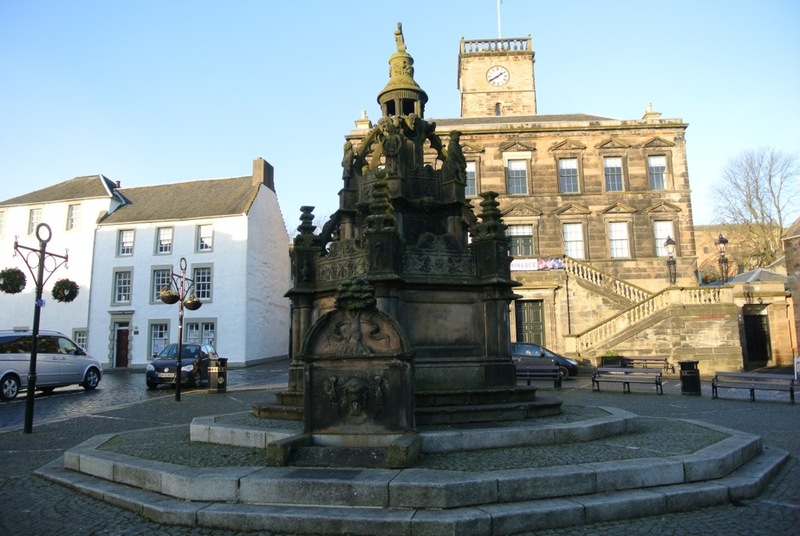 Queen’s Cross was commissioned by the Free Church in 1896 and served as a place of worship from 1899 to the 1970s. After decommissioning it did not, like many other churches, become a pub or a private home. It now belongs to the Charles Rennie Mackintosh Society and can be visited for a small sum. I’m not too keen on the rather stumpy external appearance of the church – there are far more beautiful Mackintosh buildings in Glasgow – but I love the internal details which are much more delicate. There’s a lightness created by the white walls and the sparing use of stained glass. Mind you, I haven’t visited for a while (as you might guess from the use of Wikimedia images) so perhaps it’s time to go back for a re-appraisal! Tomorrow, in R, we’ll visit a museum as an introduction to the type of buildings associated with it. To show that the Gallus Glasgow A to Z is not just something I plucked out of the air, but truly reflects Glaswegian life, see how many I managed to check off this weekend! On Friday, I was at O for Oran Mor for a Play, a Pie and a Pint – one of the best I’ve been to, a modern update of the Whisky Galore story. In Gaelic! On Saturday evening, I had a C for curry before going to B for Barrowland to see Seasick Steve. He was wonderful and, unlike many bands who act as if they are doing the audience a favour, made a point of thanking us, the citizens of the UK for giving him his job. He credits his explosion in popularity to his appearance on Jools Holland’s Hootenanny in 2006 – I remember that well: he certainly made an impression. While in the Main Hall at the Mitchell, my eyes wandered upward to another example of the Glasgow coat of arms as discussed in L for Let Glasgow Flourish. Apologies for the blurry phone photo taken from the back of the hall. I make that 5 in one weekend – not bad! 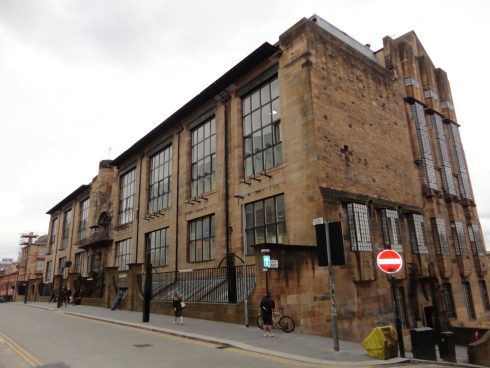 I’m reblogging this from my library blog because Charles Rennie Mackintosh’s School of Art is one of Glasgow’s most iconic buildings. I visited it just before the recent fire and these are my memories. This is not quite the post I meant to write, and for a few days I wasn’t going to write it all. Last Thursday, I visited the iconic Mackintosh Library at Glasgow School of Art – the day before the library was destroyed in a fire which ripped through the west wing (closest to camera above) of the Mackintosh Building. I thought it might be tasteless to write about it, but I’ve now decided that I should, both to record that I was part of the last group to be shown round the library and to draw attention, for anyone who is interested, to the Building Fire Fund which has been set up – you can find full details on the GSA website. So here’s the story of my visit. Nothing to do with Virginia Woolf or the sea – Glasgow’s Lighthouse is a Charles Rennie Mackintosh building that used to be part of the Glasgow Herald‘s printing offices until they moved out in the mid-80s. The Lighthouse re-opened in 1999 as Scotland’s Centre for Architecture, Design and the City. I popped in this morning after a meeting in town to see an exhibition on Derelict Glasgow, but ended up visiting the Mackintosh Centre, and all the other exhibitions, as well as having lunch in the café (hummus wrap and salad, very tasty). I also climbed the distinctive tower, which originally contained an 8000-gallon water tank, for great views over the city’s roofscape. Because I wasn’t expecting to do all this I didn’t have my camera, so the iPad photos are not wonderful. But they’ll do! 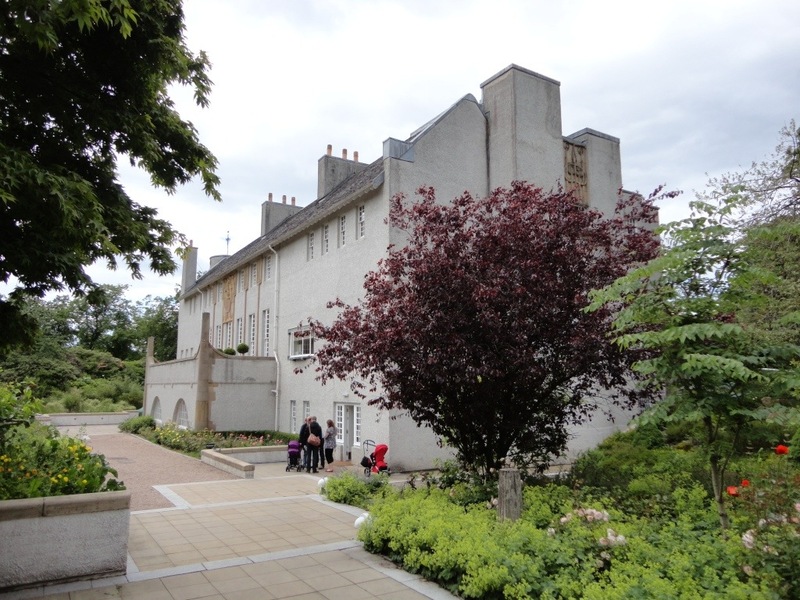 We had a lovely lunch in House for an Art Lover (designed by Charles Rennie Mackintosh but built long after his death) on Sunday, then spent an hour or two wandering round Bellahouston Park using Glasgow City Council’s Heritage Trail. There’s also a good exhibition in the Stable Block about the history of the area and the use of the park in 1938 for the Empire Exhibition, including a virtual tour through a 3D digital image of the exhibition site – the only building that still remains to be viewed physically is the Palace of Arts. It must have been amazing to visit such a concentration of white modernism if you were used to the heavy sandstone of Victorian and Edwardian Glasgow. All the information you need is in the links, so I’m just going to add a few photos. 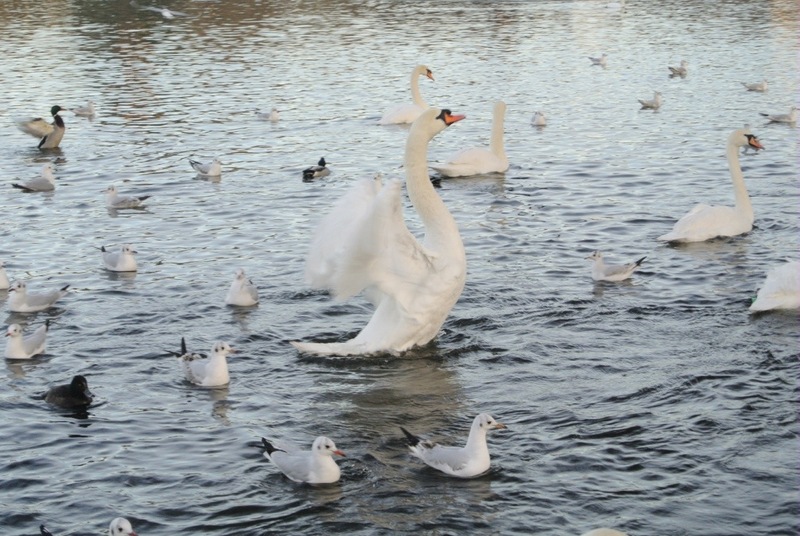 The ones that nearly got away…. So it’s Hogmanay, I’m clearing out from my iPad all the photos I’ve used, or rejected, for blogging in 2012 and I’ve found a couple of posts that I meant to write but somehow never got around to. Who wants unfinished business at the end of the year? Here’s what I nearly missed out. We went to a wedding this summer for the first time in ages. 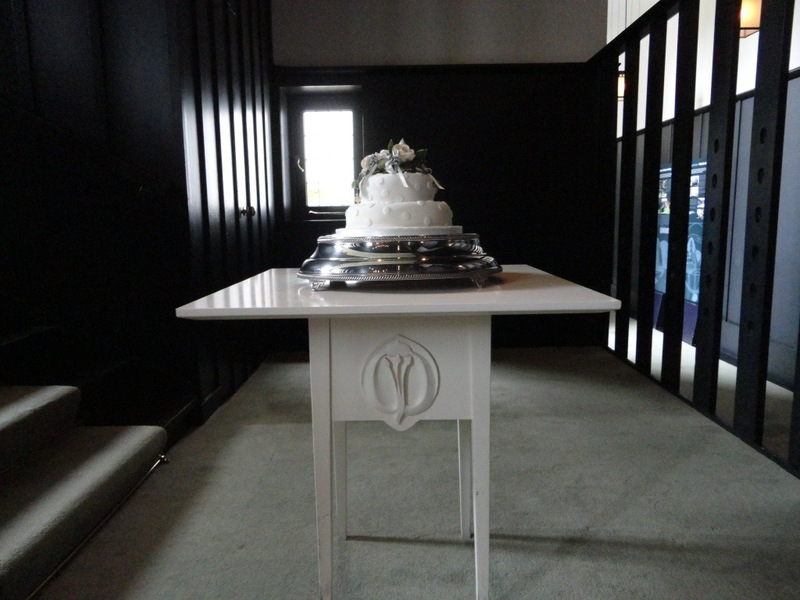 The venue was brilliant – House for an Art Lover in Glasgow’s Bellahouston Park, which was designed by Charles Rennie Mackintosh in 1901 but not built for over 90 years. Now it can be visited as a museum, as a restaurant or hired, as here, for events. I meant to take more photos of the park and do a full post but these will have to do – the exterior and some wedding details. 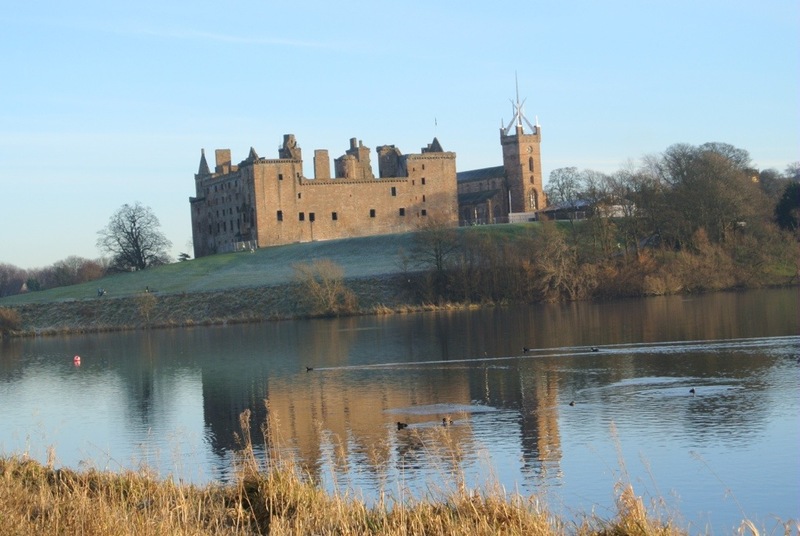 A few weekends ago, in that very cold snap, we set off for Linlithgow Palace, which we’d not visited in a long time. Idiotically, we forgot to check the Historic Scotland website and it was closed in preparation for the big Chanel event a few days later. Not being fashionistas, as I’m sure you’ve noticed, this had totally passed us by. However, we were still able to walk round the Loch and enjoy a good pub lunch in The Four Marys, a historic pub named after the Ladies-in-Waiting of Mary Queen of Scots, who was born in the palace. In the second picture below, you can see the temporary pavilion being built for Chanel. I bet the models and guests were all absolutely freezing! So that’s the end of travelling for 2012. I hope everyone has a great New Year, and see you in 2013.